We were 100% Spot On! ThemeParkOverload.net was the First News Source ANYWHERE to correctly predict Six Flags Fiesta Texas's 2015 attraction, weeks before the official announcement! Batman: The Ride is coming to Six Flags Fiesta Texas Spring 2015! Everyday, it seems, there's another rumor or hint swirling around in the Amusement Park industry. Theme Park Overload tries to stick to being a "news" website, and that's why we don't report on every little hint or speculation that comes out. But, this rumor today is something I've been hearing for almost 7 months now, and I'm just about positive it's correct. Six Flags Fiesta Texas has been teasing their New for 2015 Attraction for a few weeks now, using the hashtag #SFFT2015 on their social media accounts for clues. The park has only confirmed that the new 2015 Attraction will happen in the Rockville section of the park. and that the old Motorama ride closed on August 10, 2014 in preparation of the new ride. But...what's going in to the newly opened plot of land in Rockville for 2015? An S&S 4D Free Spin flat ride prototype. 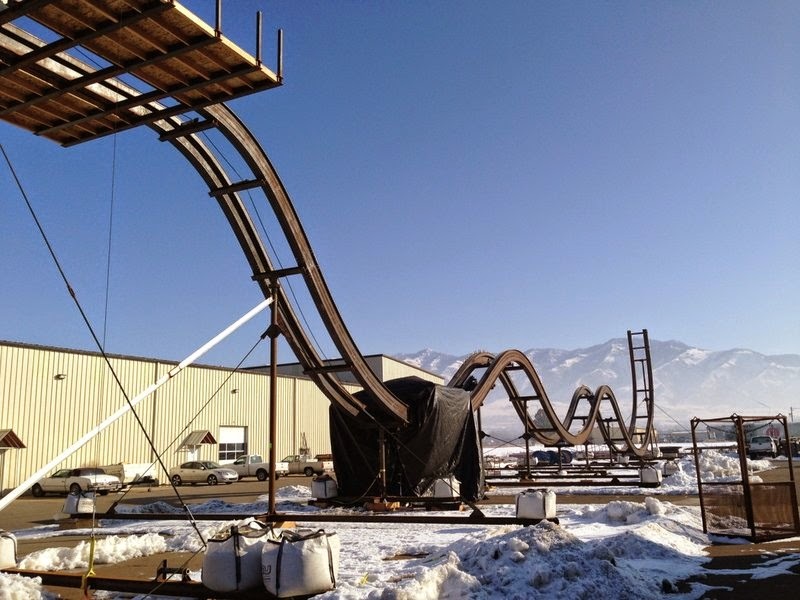 Designed by popular Amusement Park manufacturer S&S Worldwide, the 4D Free Spin pictured above is the prototyped version the company has built and installed at their facilities in Utah. Similar to their 4D coasters like X2, riders are situated in 2 abreast seating over the left and right sides of the track. The individual pairs of seats are able to independently rotate off the the main coaster car chassis, creating a unique free spinning experience. Momentum and gravity control how the seats will spin, creating a never-identical ride experience. Last month, S&S Worldwide confirmed that they'd sold one of these new 4D Free Spin flat rides to a U.S. Amusement Park. The 38 MPH, 1,265 feet long prototype has been confirmed to open "By April or late May of next year, the 4D Free Spin will debut at a yet-to-be-named amusement park somewhere in the U.S" So that narrows it down to opening in 2015 in a U.S. Amusement Park. The park has been teasing with the fictional "Rockville Reality" by talking about a "Snake Infestation" and putting up a sign with phone number to the "MK Bozer" snake wrangler. Though the recorded message to the number has recently changed from a few weeks ago to a different recording, the original contained MK Bozer talking about how "Busy he has been with the snake problems at Medusa at Six Flags Mexico and Goliath at Six Flags Great America". What do those two have in common? 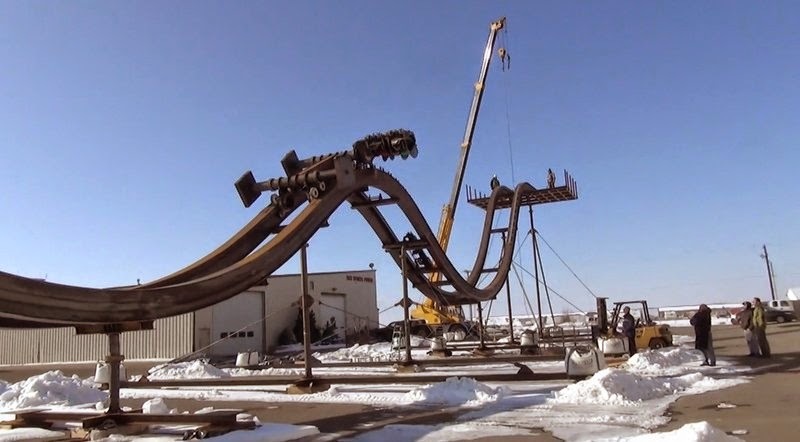 They are both the work of roller coaster manufacturer Rocky Mountain Construction. And though the new 4D Free Spin flat ride itself is designed by S&S Worldwide, the actual Coaster Track itself is I-Box Steel and Wood coaster track made by Rocky Mountain Construction. Next, the park used the "Wood" and "Steel" phrases on their Facebook page. The I-Box track used on the 4D Free Spin prototype from Rocky Mountain Construction is just this; a proprietary hybrid track design. The top layers of the track are steel, where the bottom layers are made from wood. Finally, the park Tweeted a photo of the Iron Rattler with the hashtag #SFFT2015. Why would they put the #SFFT2015 hashtag with a random picture of the completely different Iron Rattler roller coaster located elsewhere in the park? The Iron Rattler is also a creation of Rocky Mountain Construction, and utilizes the same I-Box Hybrid Wood/Steel track. Throughout different Social Media postings and the real phone number from "Rockville Reality" playing the recorded message ((210) 697-5478), interesting keywords have been thrown around. "Flying", "Out of Control", "Flips", and "Be Apart of History in the Making". The first three terms can describe the spinning and winged seating aspect of the prototype flat ride, as the design included randomized spinning and flipping controlled by gravity and weight of the riders.. The last term could be in relation to the prototype aspect of the ride, as it IS the First-Of-Its-Kind and very unique. Still a little skeptical? Well, I want to emphasize that this still is considered a "rumor" and won't be officially confirmed by Six Flags Fiesta Texas until August 28, 2014 when all Six Flags parks announce their new additions. You can stay Up-To-Date with ThemeParkOverload by "Liking" our Facebook page to get the latest on Six Flags's 2015 announcements, and many more interesting Amusement Park articles delivered right to your inbox! www.Facebook.com/ThemeParkOverload My name's Nicholous, and Thanks for Reading!